This Forum has been closed to new ideas. You can still vote and comment! 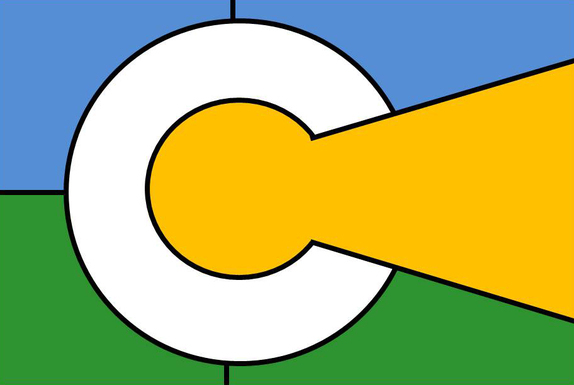 The City of Columbia set out to adopt a new, official city flag, to be designed by its citizens. In 1988, a flag was created using the city logo in order to hold a flag exchange ceremony with representatives from Mattō, Japan, now part of Hakusan, one of Columbia’s sister cities. Since then, the flag has been used at other official events and was displayed in the old Council Chambers. Our ambition is to have a flag that proudly represents our city, is used in an official capacity, and flies outside city buildings and throughout Columbia. The Office of Cultural Affairs administered the contest. We offered citizens an opportunity to create a lasting symbol for the city that captures the history, beauty, and uniqueness of our community. The contest was open to everyone, from amateurs to professional graphic designers. Applicants were asked to consider elements of a good flag design. Materials were provided from the North American Vexillological Association (NAVA), an organization dedicated to the study of flags and their cultural, historical, political, and social significance. September 15, 2014: First announcement of contest to the public. November 14, 2014: Deadline for design submissions. November 18 – December 18, 2014: Public voting period on Columbia Daily Tribune website and in person at City Hall. January 2015: Commission on Cultural Affairs and OCA Staff reviewed entries and chose finalists. September 2015: City Council reviewed finalists, selecting its top three. October 2015: Public comment open for top three finalists. The public is invited to comment on its favorite of the top three finalists, as chosen by City Council. After a public comment period, City Council will evaluate the feedback from citizens and make a final recommendation on the flag with official action at a future Council meeting. View designs ideas (below) and read descriptions of the top three finalists in the contest. All follow the rules of good flags, convey strong symbolism, and are easy to recreate. Please review each design idea and leave a comment. DESIGN #3 - Artist: Nicole Johnston - Flag Description: Elements of the Past, Present and Future (1) Environment: The blue sky and green earth express Columbia's commitment to its surrounding environment, parks, recreation and future sustainability. (2) Government and Economy: The white letter "C" highlights the city's name as well as the government and businesses fostering economic development of today and tomorrow. (3) Community and Education: The gold key figure mimics the negative space created in City Hall's key sculpture and embodies not only the individuals within our ethnically diverse community, but also the City's commitment to education and it's long-standing partnerships with the numerous educational institutions that helped form its original foundations. (4) History and Culture: The black outlines create a stained-glass window effect symbolizing the City's rich history and vibrant artistic culture. DESIGN #2 - Artist: Michael Bauer - Flag Description: The red, white, and blue bars of the flag are meant to mimic the design of the flag of Missouri. 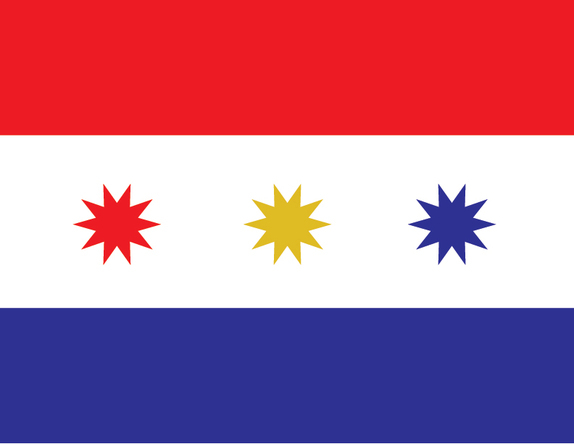 Inspiration for the three stars on the flag came from the design of the flag of Chicago, which has four stars to represent four important events in the city's history. In this flag, the three stars are representative of Columbia's status as an educational hotbed in Missouri. The red star represents Stephens College, the gold star represents the University of Missouri, and the blue star represents Columbia College. DESIGN #1 - Artist: Jon Sheltmire - Flag Description: CROSS = Represents Columbia being at a crossroads in the center of the state of Missouri. BLUE = Represents Columbia’s many distinctive rivers, creeks and lakes. GREEN = Represents Columbia’s woodlands, trails, parks and heritage of nature conservation. COLUMBIA SYMBOL = Represents our diverse, close-knit community and pays homage to the familiar, well-designed City of Columbia Logo. If the flags are being chosen in part by popular vote, please make it clearer on the site where people should vote. You might put a "Vote for this Flag" button by each flag. Thank you!